Women and Law through the “Breaking Barriers: Enhancing Swazi Women’s Participation and Representation in Decision Making” project which sought to create a platform for women’s political endeavours and roles in society and to equip them with knowledge and skills that enable them to participate actively in decision-making processes at all levels. The overall objective of the project was to promote equal participation and representation of women and men at all levels of decision-making in Eswatini. The specific objective of the project is to strengthen the capacity and leadership skills of women to confidently claim their rights and effectively engage in decision making processes. The project kick started with a Baseline study on women’s participation in leadership positions which looked at barriers and opportunities and also made recommendations on measures that could be undertaken for women participation in leadership positions. The findings of the study revealed the structural barriers that women face when encountering leadership positions, especially those political in their nature. In a bid to implement the recommendations, WLSA hosted a National Women’s Convention, in which women from different sectors were tasked with coming up with a women’s agenda for the 11th Parliament. The women’s convention brought together stakeholders from all four regions of Swaziland to have a constructive dialogue on effective women’s participation in decision making. 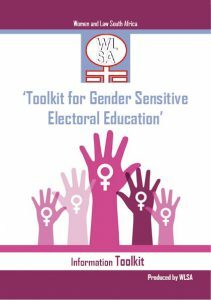 The convention unpacked findings of the research on barriers to women’s participation in decision making as well as the Women’s Charter developed in 2015.